a. ^ Tomislav is regarded as the first king due to being addressed as Rex (King) in a letter sent by Pope John X and the Council conclusions of Split in 925 AD. Circumstances and the date of his coronation are unknown. The authenticity of the Papal letter has been questioned, but later inscriptions and charters confirm that his successors called themselves "kings". ^ a b Van Antwerp Fine, John (1991). The Early Medieval Balkans. University of Michigan Press. p. 264. ISBN 0472081497. https://books.google.com/books?id=Y0NBxG9Id58C&pg=PA264. ^ Luscombe and Riley-Smith, David and Jonathan (2004). New Cambridge Medieval History: C.1024-c.1198, Volume 4. Cambridge University Press. pp. 273–274. ISBN 0-521-41411-3. ^ Bellamy, Alex J. (2003). The Formation of Croatian National Identity. Manchester University Press. pp. 36–39. http://books.google.hr/books?id=T3PqrrnrE5EC&pg=PA36 2014年1月16日閲覧。. ^ a b Jeffries, Ian (1998). A History of Eastern Europe. Psychology Press. p. 195. ISBN 0415161126. http://books.google.hr/books?id=Vzw8CHYQobAC&pg=PA195&dq=Croatia+hungary+1102&hl=en&sa=X&ei=L4TXUpijOvSS7AbDs4CoCg&redir_esc=y#v=onepage&q=Croatia%20hungary%201102&f=false 2014年1月16日閲覧。. ^ a b c Sedlar, Jean W. (2011). East Central Europe in the Middle Ages. University of Washington Press. p. 280. ISBN 029580064X. http://books.google.hr/books?id=ANdbpi1WAIQC&pg=PA280&dq=Croatia+pacta+conventa+dispute&hl=en&sa=X&ei=s2fMUouPI6b07AaFmYCADQ&redir_esc=y#v=onepage&q=Croatia%20pacta%20conventa%20dispute&f=false 2014年1月16日閲覧。. ^ Opća enciklopedija JLZ. Zagreb. (1982). ^ De Administrando Imperio: 31. Of the Croats and of the country they now dwell in. "Baptized Croatia musters as many as 60 thousand horse and 100 thousand foot, and galleys up to 80 and cutters up to 100." ^ “Croatia (History)”. Britannica. http://www.britannica.com/EBchecked/topic/143561/Croatia/223953/History. ^ “Croatia (History)”. Encarta. http://encarta.msn.com/encyclopedia_761577939_6/Croatia.html#p40. ^ Ladislav Heka (2008年10月). “Hrvatsko-ugarski odnosi od sredinjega vijeka do nagodbe iz 1868. s posebnim osvrtom na pitanja Slavonije [Croatian-Hungarian relations from the Middle Ages to the Compromise of 1868, with a special survey of the Slavonian issue]” (Croatian). Scrinia Slavonica (Hrvatski institut za povijest – Podružnica za povijest Slavonije, Srijema i Baranje) 8 (1): 152–173. ISSN 1332-4853. http://hrcak.srce.hr/index.php?show=clanak&id_clanak_jezik=68144. ^ a b Bellamy, Alex J. (2003). 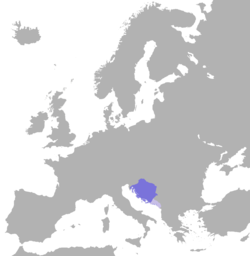 The Formation of Croatian National Identity. Manchester University Press. pp. 37–38. http://books.google.hr/books?id=T3PqrrnrE5EC. ^ Heka, László (2008年10月). “Hrvatsko-ugarski odnosi od sredinjega vijeka do nagodbe iz 1868. s posebnim osvrtom na pitanja Slavonije [Croatian-Hungarian relations from the Middle Ages to the Compromise of 1868, with a special survey of the Slavonian issue]” (Croatian). Scrinia Slavonica 8 (1): 155. http://hrcak.srce.hr/index.php?show=clanak&id_clanak_jezik=68144. ^ Jeszenszky, Géza. “Hungary and the Break-up of Yugoslavia: A Documentary History, Part I.”. Hungarian Review II (2). http://www.hungarianreview.com/article/hungary_and_the_break-up_of_yugoslavia.